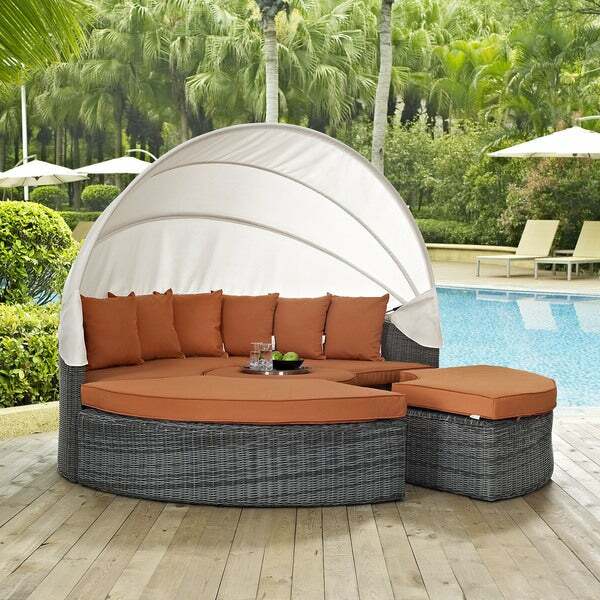 Relax in comfort and style with this canopy patio daybed set by Invite. Beige and grey tones add the perfect touch to the weather resistant materials, making this set ideal for any home. Experience the outdoors with exceptional comfort and quality. Invite offers an exquisite two-tone synthetic rattan weave, plush all-weather cushions with industry-leading Sunbrella fabric, UV protection, and a sturdy powder-coated aluminum frame. Featuring rounded arms and an elegant modern look, Invite is an avant-garde outdoor sectional series well-equipped for enhancing patio, backyard or poolside gatherings. This installment of the series is an Outdoor Patio Daybed. Chair weight capacity: 662 lbs. "Is there anyway to disassemble the bed portion & then reassemble? If yes, what would the individual piece sizes be? [Dimensions provided are: Bed: 90.5 inches long x 45.5 inches wide x 32 - 70.5 inches high]"
"What are the actual dimensions and weight capacity of this daybed?" The overall dimensions are 90.5"L x 45.5"W x 32 - 70.5"H. The overall ottoman dimensions are 60"L x 26.5"W x 13.5"H. The bed dimensions are 90.5"L x 45.5"W x 32 - 70.5"H. The end table dimension is 32"L x 32"W x 13.5"H. The weight capacity is 662 pounds.